RCS Group of Companies is committed to offering cutting-edge technology and services to our clientele. We are proud to be one of only a few companies worldwide equipped with the resources required to provide safe, quality, jet boring services. Jet boring – also known as borehole mining, jet mining or underground hydraulic mining, is a remote controlled process utilizing conventional drill rigs to drill a bore hole in the earth to a designated depth. Normally this borehole is cased to the top of the formation to be jetted. The drill rig runs in specialized tools that can cut large caverns in the host rock from the surface utilizing high pressure water jetting tools. We would refer to this as creating a cavern, mining a cavern, or under-reaming a well bore to a much larger size in comparison to the surface remotely. Cavern sizes can be 1-10 meters in diameter. This is a two part operation. In simple terms, a high pressure jet, operating vertically or horizontally, cuts the rock or formation, and then a specialized Venturi Jett lift pump removes the jetted rock materials or slurry from the artificially created void to the surface for dewatering. Jet Boring, Borehole Mining, or Jet Mining is applicable to a number of applications. 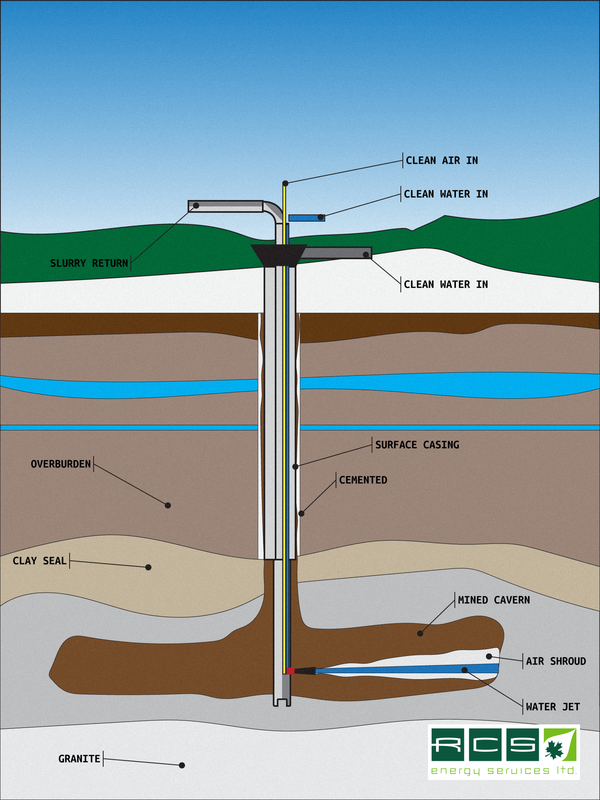 Oil and Gas Wells- Wells can be under-reamed, vertically or horizontally, to 1-10 meters in diameter in the proposed producing zone and completed with a slotted liner, sand, or gravel pack, creating a massive well in flow area potentially hundreds of times larger than a standard sized well bore. Mining Applications– This technology can be utilized to mine ore from surface or subsurface in hard to reach areas due to geology, depth, presence of water, or other reasons. The technique has been used to mine natural resources and materials including gravel, gold, diamonds, and uranium. Water– The technology can be utilized in a similar fashion to the oil and gas industry creating a larger in flow area to increase production in a vertical or horizontal well. Environmental Reclamation- Deep contaminated areas can now be reached, and soils removed, without having to dig or trench. Personnel – The ability to execute the mining process from above ground minimizes mining-related hazards and risks. On-shore or off-shore – This process can be completed from land, open pit floors, underground mines, or other vessels. Cost-effective – Borehole mining eliminates many of the costs and dangers affiliated with traditional mining processes (ex., ventilation, shaft building) to reduce overall project cost. Low environmental impact – With minimal surface disruption and waste, borehole mining offers an environmentally-friendly alternative to open-pit mining methods. Alternate Enhanced oil/gas/water – Production is stimulated by creating under-reamed areas hundreds of times bigger than standard well bores. To learn more about this innovative technology and discover how jet boring can work for you, contact us to schedule a consultation.